And we are off! Tonight we enter a new phase of making dinner. The 30-minute meal. I started a new job today and my hour plus ride home is a thing of the past. Yippee! We are starting off the week with a salad, and a little pasta. 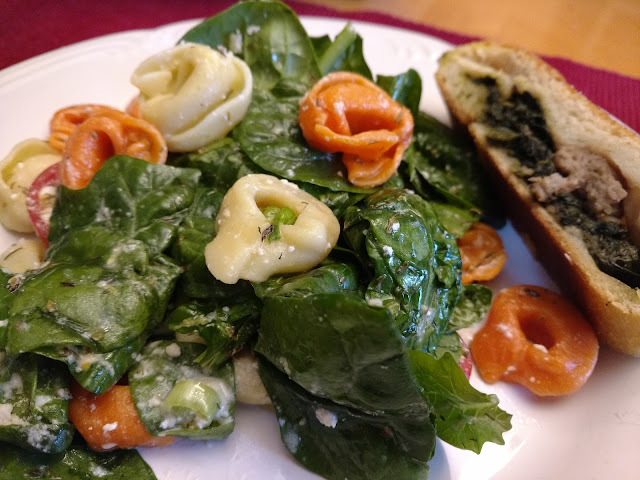 The recipe for Greek Spinach - Tortellini Salad is from Better Homes and Gardens. In a large serving bowl combine spinach, cheese, tomatoes, green onions, garlic, lemon peel and juice, oil, oregano, thyme, dill, salt, and pepper. Cover; let stand at room temperature while preparing pasta or up to 2 hours; stirring occasionally. Shortly before serving, cook pasta according to package directions. Drain pasta, reserving 1/4 cup of the cooking water. Toss cooked pasta and pasta water with spinach salad mixture. Serve warm or at room temperature. Top with shaved Parmesan cheese. Makes 6 (2-cup) main-dish servings.